Back here in 2011, I wrote this post on starting a Grateful scrapbook album. It was where I would scrap a page per week for a year about all the little things I was grateful for. I have been thinking about it for some time now and I'm not going to make myself do a layout per week and stick to the 'rules', but I am going to pop a layout in there whenever I can. Because it will be nice to look back on. I thought that it would make a great addition to my Grateful album. So there it is, my first layout for 2014. I think I did 33 last year. I wonder how many I'll get done this year? Thanks Kaitlynne! I have been looking at that yellow polka dot paper for ages and I knew I had to use it eventually! I wanted the base to be more grey, but oh well! 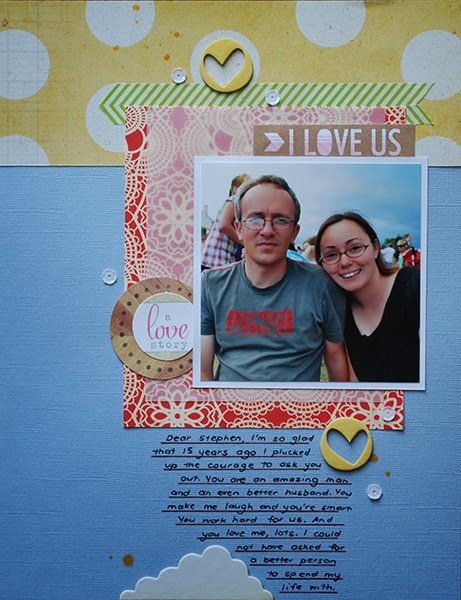 Fabulous start to your 2014 scrapping Beth :) and a great idea to create a graditude album! Thanks so much Agnus! I probably have started out to quickly and will burn out! LOL!